How long have you been at Kiwa? “On 23 October, I will have been with the company for 50 years! I was hired at the age of 17 as an apprentice instrument maker, in the craft metal working sector, to make installations and measuring instruments for the laboratories and the people who did inspections on location. I had just left school at 17 and had worked for another company for two weeks, putting things together in an assembly hall. But I wanted to be an instrument maker, to make things. Once I was a minute late because where I had to clock in was a long way from the assembly room, and I had to pay 10 cents – in those days you got paid in cash. Well, I gave the man 20 cents and went home and said I'll never go back again! Of course, my father was not happy about that, as I didn’t have a job and we had a hard time making ends meet. What have you done at Kiwa over the years? “Due to reorganizations over the years, the instrument department where I started in was dissolved, and the technical people were divided among the departments. I ended up in the plastics department, where I managed the equipment; preventive maintenance, purchasing of new equipment and the calibration system fell under me. I was unlucky, and the department was moved to Nieuwegein, where I spent five years, driving back and forth. I then moved to the drinking water department and was asked if I wanted to come back to Rijswijk, where I’ve now been for 12 years. 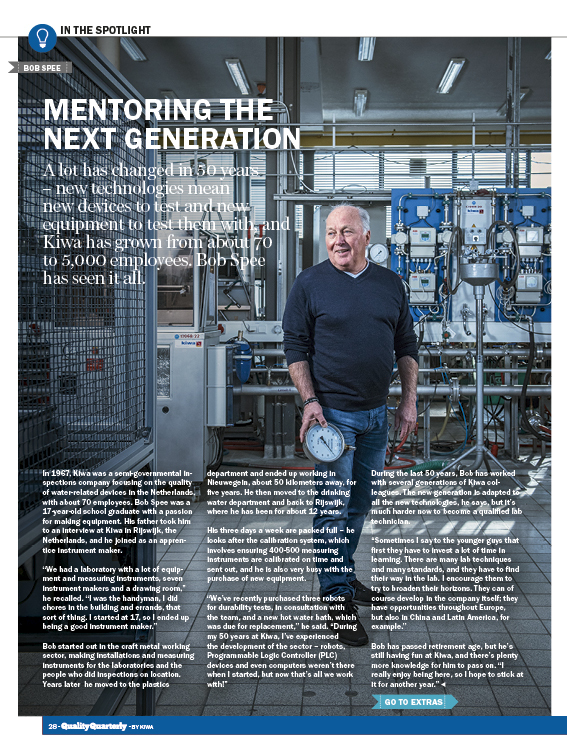 During my 50 years at Kiwa, I’ve experienced the development of the sector – robots, Programmable Logic Controller (PLC) devices and even computers weren’t there when I started, but now that’s all we’re working with. These days it’s difficult to find technical staff. Because of the very different products we have, there is often some technical part that must be made. “I work three days a week. On Monday we first have a meeting and divide up the work to be done for functional tests and endurance tests. I am busy with the purchase of equipment, and the calibration system – 400-500 measuring instruments must be calibrated on time, sent out or delivered to different locations. Then I have to check the certificates and put them into the system. What is the biggest change you’ve seen during your time at Kiwa? “There were only about 70 people when I started – we were like a family, everyone knew each other, and we would play cards, go for nights out, have a game of table tennis, things like that. There are about 5,000 of us now so it’s very different – a new generation, much more businesslike and professional. I don’t oversee the equipment for every department any more, it’s all so much more specialized and complex. Even new taps are electronic – they turn on when you move towards them. We have to monitor all these parameters, and the changes in the technology are changing the equipment we need. You work a lot with the new generation, what do you teach them? “At Kiwa, I am a mentor to Ryan, who has a lot of questions about all the different tests. I often jump in to do tests and to offer help to him. I like to teach him that way, I have a lot of experience to fall back on!